Witness to the Amritsar Massacre. The following selected extracts from the book 'The Amritsar Massacre' by Alfred Draper, 1985. "(General) Dyer followed the marching men in his car which contained his personal bodyguard, Sergeant William Anderson of the Londons, and Captain Briggs, his brigade Major." "Only a few minutes remained before sunset when the column approached the narrow entrance to the Jallianwala Bagh, Dyer immediately ordered, the fifty riflemen and forty Gurkhas with kukris to enter at the double. He followed close behind with Briggs and Anderson at his side." "Dyer shouted, 'Gurkhas right, 59th left. Fire' The order was immediately repeated by the young British subaltern in command of the Indians. The fifty soldiers knelt, raised their rifles, took aim and fired a volley into the heart of the crowd gathered near the platform." "As people began to fall dead and wounded, the and ran in all directions in a desperate attempt to esc of bullets. There was total panic as people fought to out. William Anderson was standing behind the General and a little to his right when the first volley was fired. He glanced around and noticed that Captain Briggs was just ahead of him while Mr. Plomer was standing on the left of Dyer. As the shots rang out the whole crowd seemed to sink to the ground in a flurry of white garments. Seconds later the horror of the situation struck home and people began running for the walls and clambering over while others streamed towards the entrance through which the troops had emerged. Anderson particularly noticed that there was no attempt to rush the troops and that the subaltern kept his eyes firmly on the General and when he repeated his orders the men obeyed him implicitly. The kneeling soldiers continued to fire with accu­racy and deliberation, carefully selecting their targets and making each round tell. When the soldiers had emptied their magazines, Dyer ordered them to reload and continue inde­pendent rapid fire, and to direct their fire where the crowd was densest. Anderson glanced at Briggs and noticed that he was puckering his face as if in pain and plucking at Dyer's sleeve, but he did not speak and the General ignored him and did not divert his attention from the slaughter that was taking place a few yards below and in front of him. Dyer was so totally absorbed that he did not hear the policeman; instead he cast his eyes around the scene of con­fusion below and ordered the soldiers to fire towards the peepul trees where a large number of people were seeking shelter. The soldiers were as disciplined and calm as marksmen at the butts, and there was no wild or sporadic firing. William Anderson was bewildered by what was going on. Briggs was most impressed that not one man had hesitated and none had fired high." 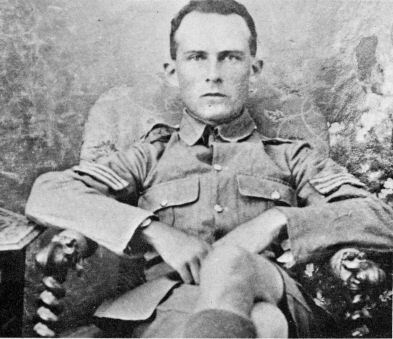 Sergeant Anderson, General Dyer's personal bodyguard. 'The Amritsar Massacre' by Alfred Draper, 1985. Buy at Bookfinder.